Check here for announcements and latest PFM news. Local 198-457 President Ed Plunkett recently appeared on the cable-access TV program Labor Vision. The program is produced by the Rhode Island Institute for Labor Studies and Research (ILSR). Host Jim Riley interviewed Plunkett about the history of the Local, some of its illustrious members, the Cavalcade of Bands, and the Local’s current and future focus. CLICK HERE if you would like to watch the entire interview on YouTube. The AFM’s Music Performance Trust Fund (MPTF) has awarded a grant to Local 198-457 for 2018. The Fund’s purpose is to promote the performance of live music. The grant will help to sponsor live performances by member of the Local in public, admission-free venues. The Fund uses a “co-sponsor” system to pay for the concerts. For general performances, like park concerts, library or civic events, the fund will pay 30% of the cost of the musicians and the “co-sponsor” contributes 70% of the cost. For medical or senior concerts, like hospitals, senior centers and non-profit nursing homes, the fund will pay 40% of the cost, while the “co-sponsor” pays 60%. For educational venues, like school concerts, the Fund will pay 50% of the cost and the co-sponsor need only pay 50%. Of course, in all cases, the concerts must be free and open to the public. Organizations which are interested in participating in the MPTF concert series should contact Local 198-457 President Ed Plunkett at (401) – 780 – 6887, or via email at eplunkett@ProMusicRI.org. Pianist / Accompanist / Arranger Mike Renzi views the new display honoring him at the Rhode Island Music Hall of Fame in Pawtucket, Rhode Island. The Rhode Island Music Hall of Fame (RIMHOF) has inducted Local 198-457 member Mike Renzi into its Hall of Fame. 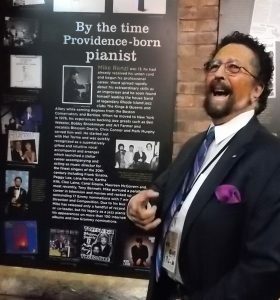 Renzi is a Providence native who has been piano accompanist to some of the greatest names in the music business, including Mel Torme, Jack Jones, Peggy Lee, Maureen McGovern, Lena Horne and Tony Bennett. He was musical director of the PBS children’s TV program Sesame Street for twelve years. Additionally, he has been nominated for Grammy awards 17 times and has won 7 Grammies. Renzi’s formal induction into the Hall of Fame occurred on Thursday, April 26, 2018, as part of a concert he gave at Chan’s Restaurant in Woonsocket, Rhode Island. At that time he was presented with the award by RIMHOF directors Rick Belaire and Bruce McCrae (aka, Rudy Cheeks). Performing with him at the concert were Local 198-457 members Paul Del Nero, on bass, and Vinnie Pagano, on drums. Also honored that evening was Chan’s owner, John Chan, for his efforts over the years to present live jazz and blues to the Rhode Island music community. On Sunday, April 29, 2018, the unveiling of the murals for the new honorees took place at the Hall of Fame’s headquarters in Pawtucket, Rhode Island. There will now be a permanent display honoring Mike at the Hall of Fame. The new PFM office, co-located with ATU Local 618, at 172 Longfellow Street in Providence. After more than twenty-five years in Cranston, RI, Local 198-457 has moved its office to Providence. The move occurred on July 27, 2017, with the office open for business on the following Monday, July 31. 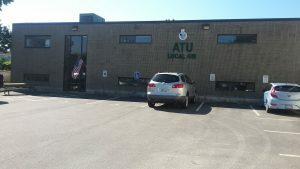 The new office is located in the building owned by the Amalgamated Transit Union (ATU), Local 618, on Longfellow Street , off Elmwood Avenue, in Providence. Our Local is subletting one office in the building from Local 618. Interim President Al DeAndrade and Interim Vice-President Ed Plunkett worked hectically throughout June and July to find new office space, as the Local’s existing lease was set to expire on July 31, 2017. The new office represents a substantial “downsize” from the Local’s former, rather spacious “digs”. However, the decrease in rent will save the Local a substantial amount of money every year. Additionally, Local 618 has very generously offered to let us use their large conference rooms for membership meetings as well as executive board meetings. Vice-President Al DeAndrade (l) reads the citation for retiring President Artie Cabral (c). Having completed nearly twenty years as President of the Providence Federation of Musicians, Artie Cabral has decided to retire. The effective date of his retirement was June 8, 2017. 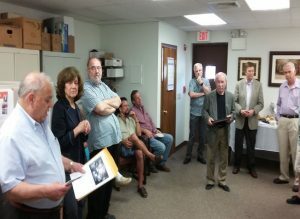 A reception for Artie was held at the Local’s headquarters on June 8 and was attended by many of Artie’s friends and colleagues from the music world and Local 198-457. Overseeing the mergers of Local 529 in Newport and Local 262 in Woonsocket. In addition to his union duties, Artie actively booked local musicians into Foxwoods Casino in Connecticut and Twin River Casino in Lincoln, Rhode Island, thus keeping many members of Local 198-457 employed. He also kept up an active career as a performer, traveling and performing for many years with Mickey Rooney, as well as accompanying many nationally-known artists who came to the New England area. In retirement, Artie expects to remain active as a musician. We can all expect to see him “on the gig” soon. Per Local 198-457’s by-laws, Vice-President Al DeAndrade has been sworn in as interim President to fill the remainder of Cabral’s term, which expires in January, 2018. 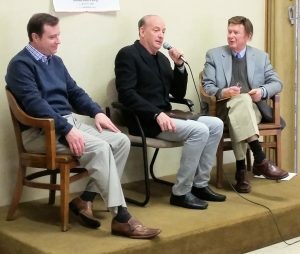 Conductor Larry Rachleff (c) addresses the members of the Local, flanked by David Beauchesne (l) and John Worsley (r). On Sunday, March 19, 2017, Local 198-457 held a special meeting to honor Rhode Island Philharmonic Orchestra conductor Larry Rachleff. Larry is retiring after serving for twenty one years as music director of the Philharmonic. At the ceremony, Board Member John Worsley read a citation listing Rachleff’s many achievements with the orchestra. Vice-President Al DeAndrade presented the outgoing director with an honorary lifetime membership in Local 198-457. The maestro expects to concentrate now on his teaching duties at Rice University in Houston and on spending more time with his family. A Treasury of Rhode Island Jazz and Swing Musicians is finally published!